I'm impressed. 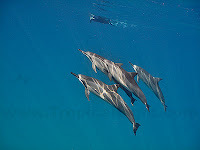 Even though my new friends, Scott and Cara visiting from Washington, had never swum with Spinner Dolphins before this morning, they knew a lot about them. 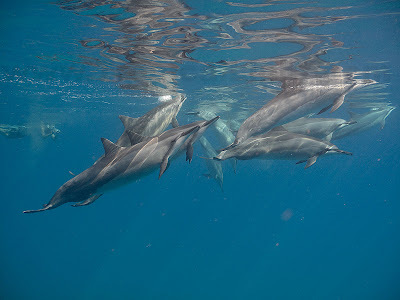 Such as the fact that dolphins never sleep, instead they enter a trance state in order to get rest. 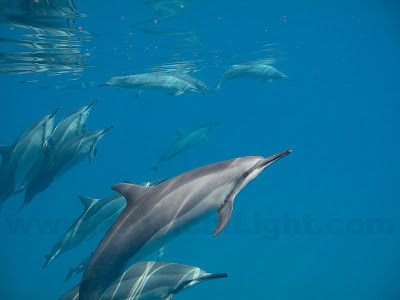 Even though they were clearly resting, the 36 dolphins were fairly interactive and were also playing the Leaf Game. One even dropped a leaf in front of me, which I carried on my hand briefly before returning it to the dolphin. I am easily entertained. Click HERE for lots more photos from this morning. I had my family is a similar spot over Thanksgiving week. Left my freediving fins and mask along the shore...they were gone later in the day...expensive mistake. Great photos. What camera are you using? Canon HF S10: 1920x1080 resolution. The Housing is a Light and Motion BlueFin. State of the art (pro/consumer)...for the next six months anyway. Very nice vid cam and housing ... great for freediving but...its too bulky to go on the group swims. I also have Canon D10 camera which is waterproof to 33 feet...it does pretty well and can go along on the swims without effort, but you've got a professional eye with the photos you take. Anyway...thanks for the photos as it is an escape from the winter snow and cold. Check out Maui Sporting Goods in Wailuku - Brian's the man up there - they have excellent freediving fins and masks...pick up a light weightbelt and you'll be set free from the buoyancy!